Buchia crassicollis, copyright Erica Clites. 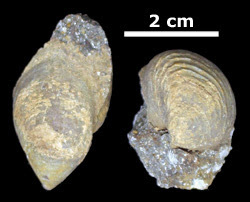 Buchia is a genus of mussel-like bivalves known from the Middle Jurassic to the Lower Cretaceous (Cox et al. 1969). Characters (from Cox et al. 1969): Strongly prosocline, height well exceeding length; highly inequivalve, left valve strongly convex with more or less prominently projecting umbo and prosogyrous beak, right valve flat to feebly convex with its umbo scarcely projecting; right anterior auricle concave tonguelike process which is not in alignment with hinge margin but extends toward left valve and rests in socket in its cardinal area in front of beak; cardinal area an inequilateral triangle of moderate breadth in each valve, with shallow ligamental pit directed backward from beak, pit of left valve with raised margins; ornament of concentric ridges or ribs, occasionally with subordinate radial threads.